View our platinum rings here. Platinum rings are gaining in popularity as we speak. Many people are drawn to the unique color and luster of this fabulous metal. Platinum has not always been used for jewelry. It was not until the 1940's that this metal really took off in terms of jewelry. Platinum is the most durable ring material. Platinum is the diamond of the rings. If you are looking for the perfect rings for your wedding, platinum rings are well worth considering. Platinum jewelry may look almost exactly like white gold but it is actually very different in terms of strength and durability. 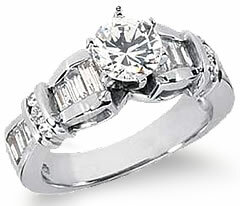 Platinum rings are a wonderful choice when you are looking to purchase your wedding rings. Platinum is a great metal for both men's rings and women's rings. It's durability makes it perfect for men who work with their hands. Your platinum ring can have stones set into it but it is not necessary. A platinum ring is just as gorgeous as a simple band as it is as a diamond ring. Platinum offers universal appeal. When you are shopping for platinum rings you need to be aware of how platinum is marked. Just like gold and silver, platinum is marked to show purity. This is how you will know how much you should be paying for the platinum rings. Knowing these platinum markings will help you in choosing the best platinum ring. Platinum rings are the perfect rings for all of your wedding needs. They are great as gifts for any occasion. Platinum rings are beautiful to look at and to wear.